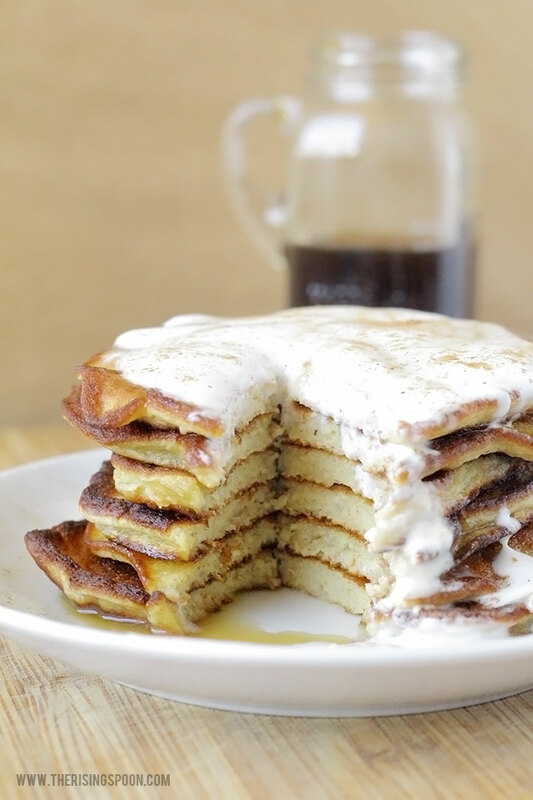 Do you love eating pancakes, but hate dealing with the carb coma afterward? 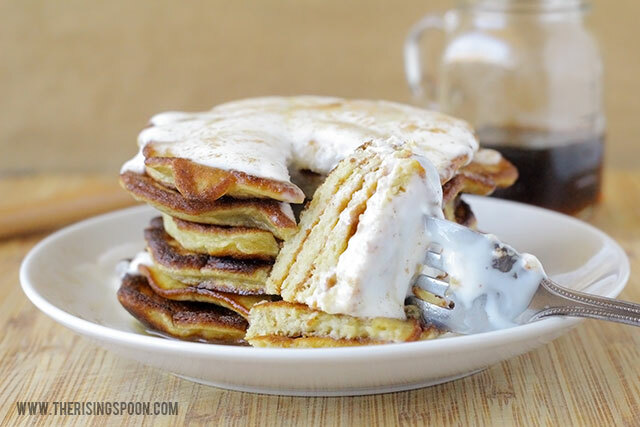 Traditional pancakes always make me want to take a nap after eating them! That's fine and dandy on a lazy Sunday when your to-do list is 1) snuggle under a blanket and 2) surf Pinterest, but no good when you have real adulting to do. 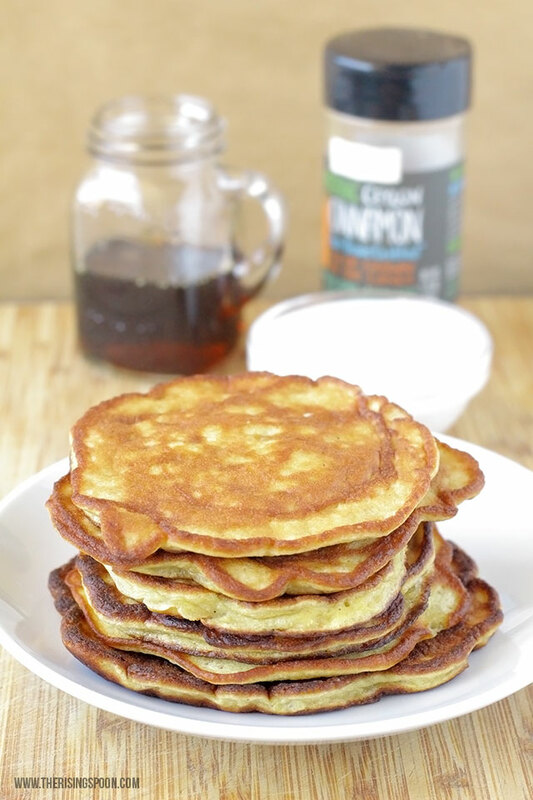 Fortunately, there's an easy alternative that will make your belly happy while also energizing you for the day: banana egg pancakes. The two main ingredients in this recipe are ripe banana and egg. I told you it was easy, right? This is something you can throw together for a quick meal in about ten minutes or less. There are tons of recipe posts on the interwebz for 2-ingredient banana pancakes that only call for bananas and eggs mixed together. There's a good chance you checked out a few of them before landing here on The Rising Spoon. I was tempted to try one myself, but luckily I checked out the comments section first. Way too many folks responded by saying the pancake batter was too thin or (worse) that the eggs started to scramble in the pan instead of forming a pancake. I know as a food blogger I should be comfortable with recipe testing and dishes coming out imperfectly, but I really dislike wasting food! I'm sure you can relate! I concluded that the pancakes needed some sort of binder (even if it was just a small amount), and I didn't want to end up with scrambled eggs a la banana, so I did a little recipe tweaking that paid off. I used einkorn wheat flour for these banana pancakes since it's what I had on hand and I'm totally in love with how it makes my body feel (i.e. no carb coma); however, feel free to use your favorite gluten-free all-purpose flour blend or grain-free flour (like coconut or almond) instead. Homemade coconut flour or almond meal is a good frugal option if you're wanting to use up the leftovers after making homemade coconut milk, almond milk, or almond milk coffee creamer. 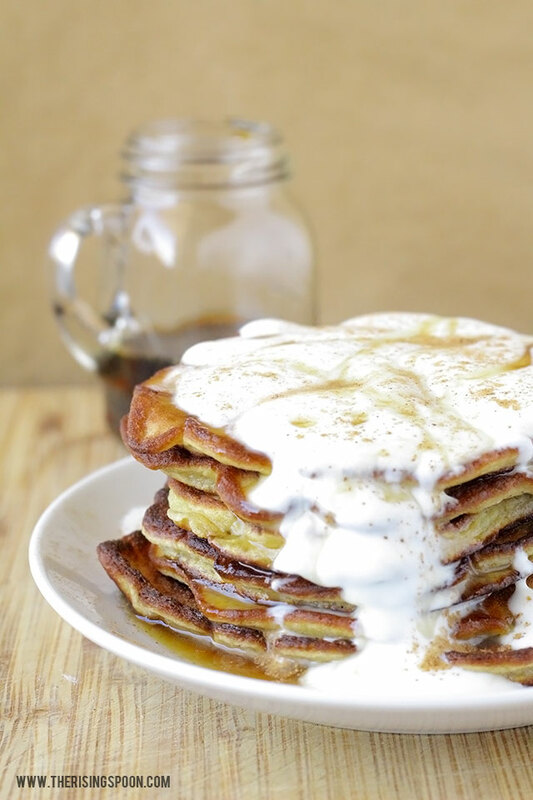 Because the primary ingredient in these banana pancakes is eggs instead of flour, their texture is softer and more spongy than traditional pancakes. Since they hold their shape well, they look and feel like a pancake until you bite into them. Add the banana to a mixing bowl and mash well with a fork so it's smooth with no big chunks. Crack in both eggs and stir until combined. Add the baking powder, sea salt, cinnamon powder, and collagen (if using), followed by your preferred flour. Stir everything until it's well incorporated and the pancake batter is smooth. If you notice any chunks from the banana or lumps from the flour, use your fork or cooking utensil to smash them out. Heat a skillet to medium-low and add enough cooking oil to lightly coat the bottom of the pan. When the skillet is warm, place a few spoonfuls of the batter in the pan (amount will vary based on the size of pancake you want). Cook 1-2 minutes or until the edges of the pancake start to darken and you see bubbles in the batter. Flip the pancake and cook it 1-2 minutes more, or until the pancake is cooked through and golden on both sides. Repeat this process until all the batter is used up, adding more cooking oil as needed if the pan starts to get dry. Serve pancakes immediately with your favorite toppings like real maple syrup, fresh fruit, and yogurt. Store any leftovers in the fridge, tightly wrapped and consume within a few days. This recipe makes 4 regular-sized or 6 mini pancakes, which is enough for one person as a small stand-alone meal or two folks with other sides served as a meal. If your eggs and banana are extra-large, then you may need to add an extra 1/8 cup (give or take) of flour to help thicken it up since you're working with more liquid. Just eyeball it! The baking powder helps to give the pancakes a little rise (you'll see them puff up a bit in the pan); however, once they're out of the skillet they tend to flatten within a few minutes. Not sure if that can be helped, but I don't mind! If you notice that the pancakes are getting too dark or burnt, reduce your heat to low OR take the skillet off the burner to let it cool off a bit between each pancake you cook. Have you ever tried pancakes with little or no flour? What are your favorite mix-ins and toppings for pancakes? 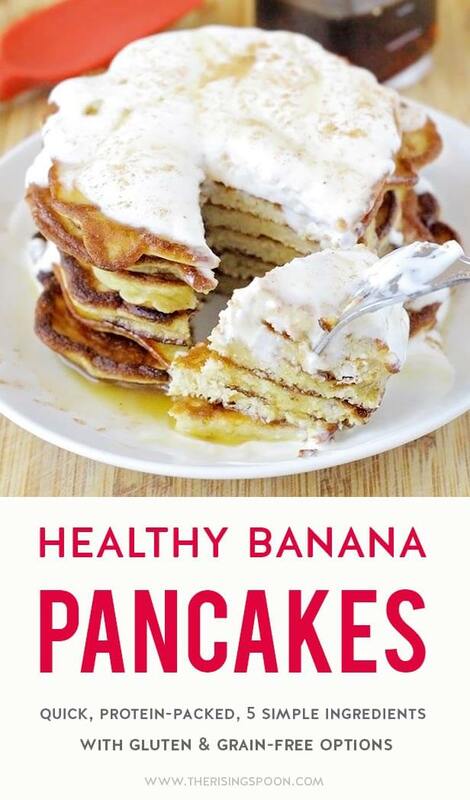 Click Here to Pin This To Your Breakfast Recipes Board on Pinterest!